The doors have large hinge plates with hoops/bands and come with metal pins to fix them to the wall. They also have an elaborate door latch and keep with ornate handles. 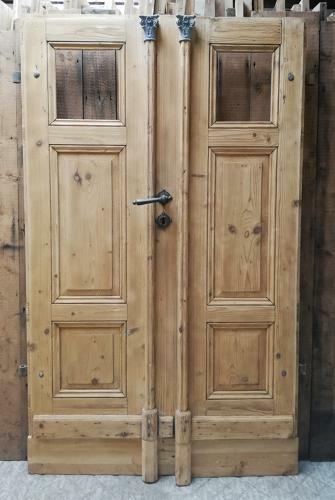 With decorative wooden columns and cast metal details to the top and bottom, 2 panels for glazing and 4 fielded panels, this is an unusual pair of doors that would make a wonderful internal feature in a kitchen, or as wardrobe doors for example.